Hi! I am a member of a group called the Brush & Palette painters. The group has been together 50 years and I have been a member for about three years. It's a wonderful group of women and I am proud to be a member. 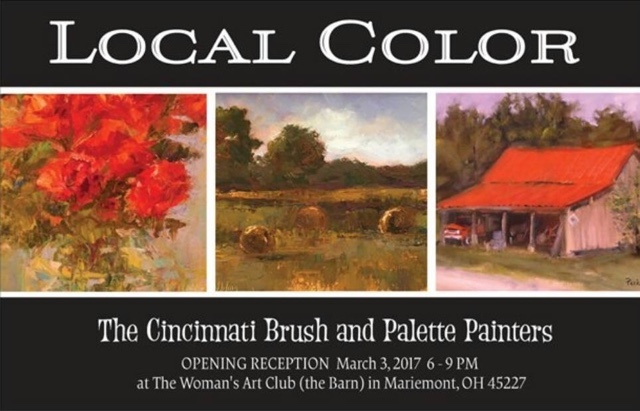 Each year we have a show for the whole month of March at the Cincinnati Womens art club in Mariemont. Please join us if you live in the Cincinnati area, our opening is wonderful, lots of great food and wine. I will have five larger pieces in the show and a "tiny treasure" . Also I will be there sitting the show on the 18th from 1-4 so come by and visit me then. That is my painting of the barn and truck, proud to be included on the invitation. Hi, recently I was contacted by Adam Ziemba from NoblePortraits.com. He found me by way of my blog and was interested in interviewing me. Below is the link to the interview and check out his website while you are there. Have a great day!